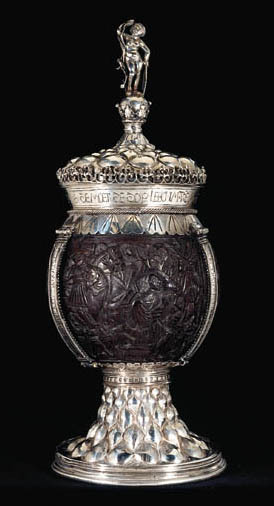 The inscription around the rim translates as 'who wants to crack this nut to taste its sweetness' and on the straps, 'I can increase my gathering by allowing my companions to drink in abundance'. 1913 Bath House Inventory, p. 27, no. 140, in the Red Room, in the 'large glazed case near door - Left Hand Division'. 1914 Wernher Inventory, p. 26, no. 133. Saint Hubert (d. 727) was, according to legend, a young man given to worldly pleasures, especially the chase. While hunting on Good Friday he was confronted by a white stag bearing a crucifix between its antlers, which brought about his conversion to Christianity. He was Bishop of Maastricht and later of Liege and, following his canonisation, was a particularly popular saint in the Low Countries.